I had to put on white socks today in order to write. I have these quirky ways about me, habits and routines I have to slip into in order for my writing brain to actually switch on and work. A certain noise level I can handle. A particular number of distractions I can tolerate. Where I can sit in my house. The tea that I drink. The fact that the dishes are done and the laundry is washing. And white socks help, too. Normally, you won’t find me padding around the house in bare feet, but today I just jumped right into the morning routine and didn’t even pause for socks. But then I sat down to write. And I couldn’t. Turns out something as simple as comfy feet can kick my brain into gear. More important than all of that, of course, are your prayers. Thank you so much, my friends, for praying for me. 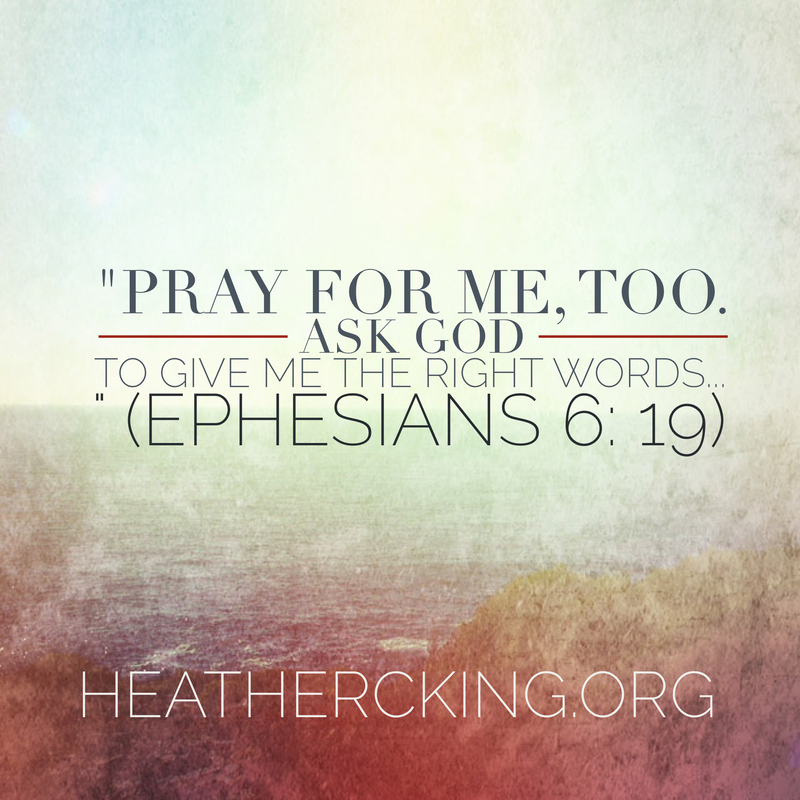 I’ve received notes from you saying, “I’m praying!” on the most needed days and at just the right time. Those prayers have had such power for me and I have felt them, giving me bursts of energy and inspiration during weeks when the schedule seemed crammed and writing seemed like the impossible dream. I have become like Paul, recognizing the power of a prayer team when he asked the church in Ephesus to “pray for me, too. Ask God to give me the right words so I can boldly explain God’s mysterious plan…” (Ephesians 6:19 NLT). Thank you for lifting me up to Christ in prayer. Thank you for being part of that prayer team for me. I’m still writing away at the new book with about 2/3 done so far. July, for me, is going to be one of the busiest months we’ve had all year, so your prayers during this month are so appreciated! So, I’m writing about having that faith to go Anywhere God chooses to send you….even when it’s scary, or doesn’t make sense, or seems impossible. The book is scheduled for release in October 2016!! In July, I’ll also be speaking for a women’s retreat with 5 sessions on hope based on Jesus’ conversations with women in the Gospels. I’m so honored to share with these ladies and so excited to spend the time with them. Once again, I ask for your prayers, that God will direct my heart and guide me as I prepare and speak. Pray for these women as they gather, that God will meet them in powerful ways and work to bring them healing, guidance, restoration, and strength. Thank you again for your prayers. God is able! Can’t wait to read your new book, Heather!